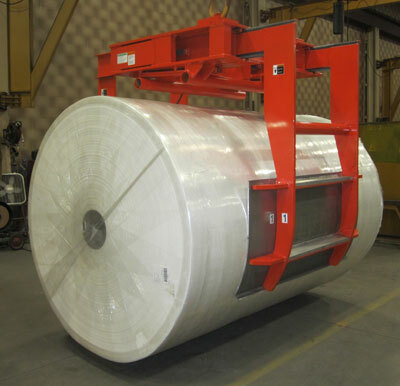 The Below-the-Hook crane attachment is used to lift paper rolls on and off a stretch wrapper. Each roll lifter Bushman manufactures is designed specifically to customer needs and requirements. This unit had a challenging weight restriction. Bushman’s solution was to provide lighter weight aluminum gripping pads. The lifter is equipped to handle a roll up to 5,000 pounds, gripping around the OD rather than engaging the core. It picks rolls measuring from 36” to 72” in diameter and 60” to 102” in length. It is the third piece of equipment Bushman has made for Clearwater; lifting tongs and a spreader beam having been delivered the past.